An intense fightback by the Islamic State group in Libya’s Sirte slowed an advance by pro-government forces Monday into the jihadists’ North African stronghold. Forces allied with Libya’s unity government made rapid gains in Sirte last week, pushing IS out of the port and the airport on the edges of the coastal city, 450 kilometres (280 miles) east of the capital Tripoli. But the advance, under cover of air strikes and heavy artillery, slowed as pro-government fighters reached residential areas near the city centre. Most of Sirte’s residents have fled but officials have said some 30,000 civilians remain in the city. As the fighting degenerated into a street-by-street battle, IS militants holed up in the central and northern parts of the city hit back with sniper fire, improvised explosives and suicide car bombings. Three IS fighters drove cars laden with explosives at pro-government troops and a field hospital on Sunday, killing at least one fighter and injuring four others, a unity government spokesman told AFP. A group of pro-government fighters responded by attacking IS positions at the main western entrance to the city on Sunday afternoon. They came under intense fire from the jihadists and withdrew as evening fell, an AFP journalist at the scene reported. A pro-government fighter was injured by sniper fire during the operation and taken out of the area. But another fighter involved in the battle sounded an upbeat note on the operation. “Our ground forces will advance despite the difficulties,” he said. The AFP journalist filmed pro-government fighters firing assault rifles at IS positions from inside buildings on the edge of the city. One fighter was injured and lay on the steps next to building as his colleagues shouted for medical assistance. “The infantry has advanced inside Sirte with a great deal of effort,” said Mohammed al-Fadel, a pro-government fighter. IS — which is estimated to have some 5,000 fighters in Libya — seized control of Sirte last year and turned it into its main base of operations in North Africa. The loss of the city would be a major setback for the group, which has also been losing territory in Syria and Iraq where IS established its self-declared “caliphate” in 2014. The forces battling to oust the jihadists from Sirte include militias from western cities, notably Misrata, and the guards of eastern oil installations that IS has repeatedly tried to seize. Under the command of Libya’s UN-backed Government of National Accord (GNA), they launched the assault on Sirte, the hometown of Libya’s ousted dictator Moamer Kadhafi, a month ago. 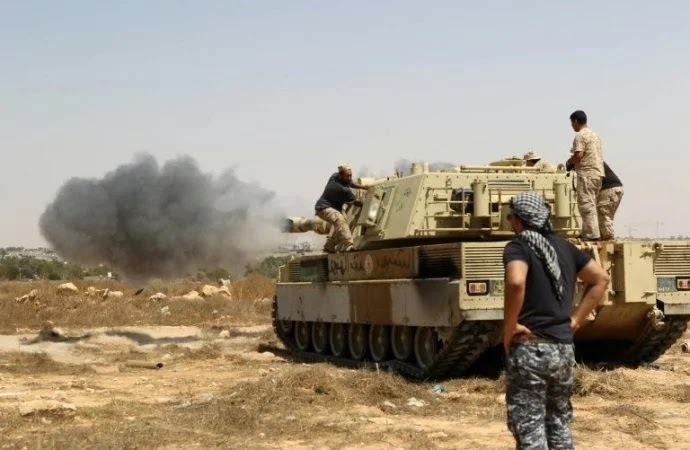 Directed from a joint command centre in Misrata, 190 kilometres (120 miles) to the northwest, pro-GNA forces have deployed tanks, rocket launchers and artillery in the fight for the city. Forces from Misrata — who have an arsenal that includes MiG fighter jets and attack helicopters — carried out dozens of air raids against IS. Pro-GNA forces entered Sirte last week, taking the city’s port on Friday and advancing on residential areas in the city’s east. Following rapid gains, a spokesman for the pro-GNA forces predicted on Thursday the city would fall “in two or three days”. But the advance slowed over the weekend, as IS responded with machineguns, mortar rounds and sniper fire, as well as car bombings. According to medical sources in Misrata, at least 140 pro-GNA fighters had been killed and 500 wounded since the operation began on May 12.